Tiger Woods no longer is the feared golfer he once was. He's not a dominant player, and golfers who once feared his presence perhaps see him now as nothing more than an above average player who shows flashes of brilliance sporadically, and can win the occasional tournament and look like his former self. Even though his fellow PGA pals aren't scared of Woods on the golf course anymore doesn't necessarily mean they're glad he's not playing on a weekly basis. Woods announced he'll be returning from a back injury that has kept the iconic golfer on the shelf for quite some time. Woods makes his return this Friday at Congressional in the Quicken Loans National. While this tournament hardly is The Masters or British Open, it's always nice to see Woods back on the greens and battling the fairways, his fellow competitors and the droves of reporters and media who still clamor to get a glimpse of this would be hall of fame golfer. And that's why other golfers really don't mind seeing Woods walk back on to the course after being absent for so long. Woods still draws fans and television ratings. He's a name, and often name value isn't given its just due. Woods is a superstar in his sport, an iconic presence in his profession and the kind of athlete that you can't help but keep your eyes on, no matter how far past his "prime" he might be. Granted, Woods still is a young man, but injuries and off the course, personal headlines have derailed the momentum that allowed him to gain notoriety so quickly within golf. The PGA also is grinning from ear to ear with the announcement that Woods is on his way back to the course. The PGA is devoid of a draw. In the years that Woods has started to decline a bit, no one has stood out as the next big thing. The fact that not one golfer has assumed the "torch" from Tiger suggests that cultivating superstars in golf isn't something that comes easy, so the PGA is tickled that Tiger is teeing off again in the not so distant future. 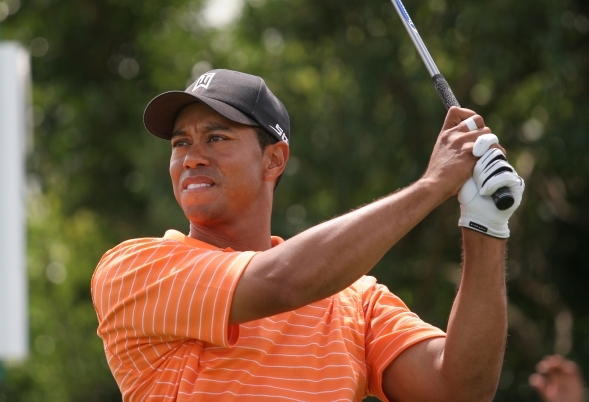 Woods probably won't do much next week at the Congressional in the Quicken Loans National. He's feeling a little "rusty" as he puts it, and his back undoubtedly is going to need at least a few tournaments to get back to professional form before talk of winning a tournament starts to permeate through the PGA Tour. Even at 50% and feeling average, Tiger never will be mediocre when it comes to how he's perceived by fans on a multitude of levels. A true force in the world of sports is equal parts winner and has the innate ability to pull in the casual fans who might not be golf diehards but still have to at least take a peak at what Tiger is doing. It's that sentiment that makes him invaluable to his trade and to the sport he's helped grow since he first started as a teenager. And for that reason, the PGA and golf in general is going to hold on to Woods and his legacy as long as he's able to at the very least swing a club.